This space wallpaper shows the dark and shadowed regions of the Moon that fascinate astronomers and Pink Floyd fans alike. 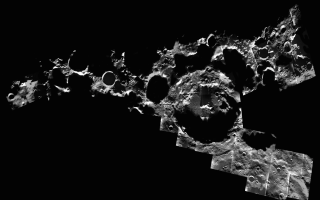 This space wallpaper shows the dark and shadowed regions of the Moon that fascinate astronomers. Our Moon’s rotation axis has a tilt of 1.5º, meaning that some parts of its polar regions never see sunlight – the bottoms of certain craters, for example, are always in shadow.